With JC Electrical no jobs too big or small at JC we do it all! Contact us now for a Free No-Obligation Quote, No Call Out Charge! 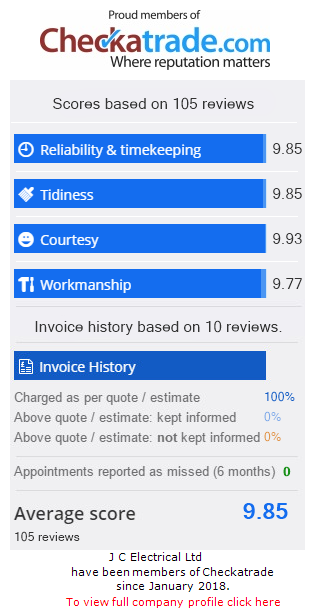 See what our clients have to say about our work on CheckaTrade an independant service for vetting and monitoring trades. All our work is carried out to meet BS7671, 17th edition electrical wiring standards. We cover locations all over London and the South East. Efficiency is reducing the amount of energy you use to save you money. Working with JC Electrical ensures that you will receive the finest in design and technology solutions by working as a team with leading industry partners. With over 25 years experience in the electrical industry, our clients know that they can depend on us to have their electrical systems tested, on-time and to the correct specifications. At JC Electrical we take health and safety very seriously. All our electricians are trained to meet the regulations to ensure the safety of themselves and the members of the public. Mechanical installations are liable to gradual deterioration, particularly those situated outdoors or exposed environments. It is vital that all installations are properly installed by a qualified person with the appropriate skills and knowledge. JC Electrical approaches every project with a professional attitude and sets high standards for its services. At JC Electrical we have a responsibility to work professionally to work to meet the requirements of relevant standards. As an approved contractor of the NICEIC we understand the needs and requirements to provide unequalled services. Our company and a selection of our work are annually inspected to ensure that our work is competence and compliance. Plumbing falls within the Building Engineering Services sector, this includes: water, heating, electrical, gas, ventilation, refrigeration, air conditioning, telecommunications, plus escalators and lifts. If plumbing installations are not completed correctly then they can cause considerable damages. At JC Electrical we have the knowledge and expertise needed to ensure your plumbing installations are running efficiently and safety. Ben and the team were great, very polite and kept me informed of what was happening at every step of the way. They were always tidy and on time. Would 100% recommend them. Really good nice blokes, John the main man came down on a Friday night to sort out the problem and when the lads came out they were very courteous tidy took ride in there work and we would defiantly use them again. I have used JC Electrical on a personal basis in my home as well as multiple jobs completed for my companies customers in their homes as well as jobs within our own retail store. I would not hesitate to recommend using JC Electrical for any type of Electrical job from basic fault finding and repairs right up to rewires and new main fuse boards. All of the staff I have dealt with have been polite and friendly and very efficient. I believe that the prices charged by JC Electrical are super competitive and more than fair in the market. I feel that this company deserves 5 stars.